Indiana travels north to Ann Arbor to open Big Ten play on Saturday afternoon against the Michigan Wolverines. Michigan is 6-2 and coming off of an 86-71 loss at North Carolina on Wednesday in the Big Ten-ACC Challenge. Ready or not, conference play has arrived. Thanks to Jim Delany’s desire to stage the Big Ten tournament in historic Madison Square Garden, this year’s condensed conference schedule means a pair of league games have been moved to early December. 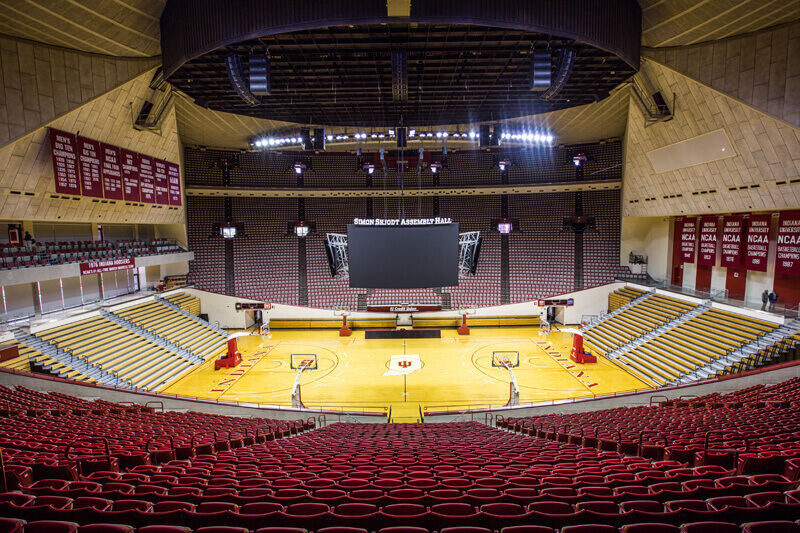 No Big Ten team has its two conference games sandwiched by tougher competition than Indiana. The Hoosiers will play Michigan on Saturday and Iowa on Monday as follow ups to Wednesday’s 91-81 loss in Bloomington to No. 1 Duke. And after Indiana opens league play, it will go to Louisville on Saturday, Dec. 9 and then play Notre Dame on a neutral court the following Saturday. 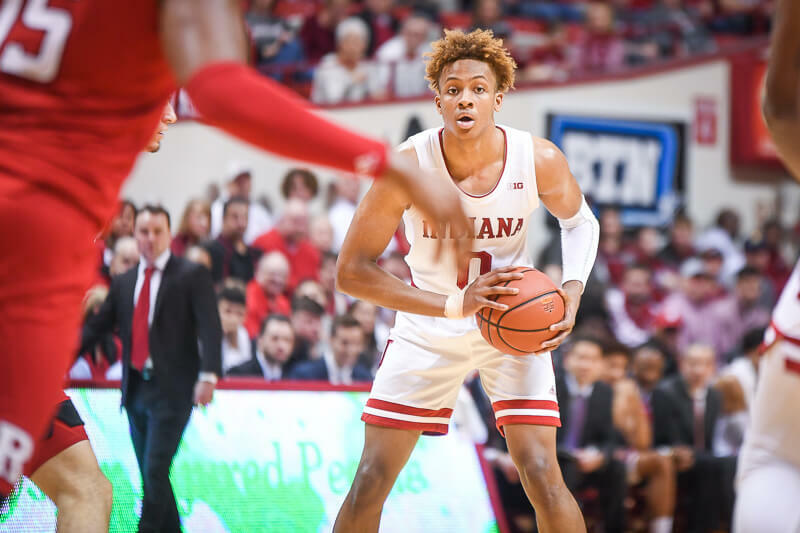 Indiana has made significant strides in the three weeks since losing by 21 at home to Indiana State, but we’ll soon find out if that progress can translate to wins. John Beilein has built one of the Big Ten’s most consistent programs by producing elite offensive teams that don’t turn the ball over. Michigan was 14-9 at one point last year before going on to win the Big Ten tournament and advancing to the Sweet Sixteen. But through eight games, this Michigan team is still a work in progress. The Wolverines have one notable win thus far, a neutral court victory over VCU in the Maui Invitational. Michigan doesn’t have a reliable replacement for Derrick Walton Jr. and the Wolverines also miss D.J. Wilson, who left for the NBA. 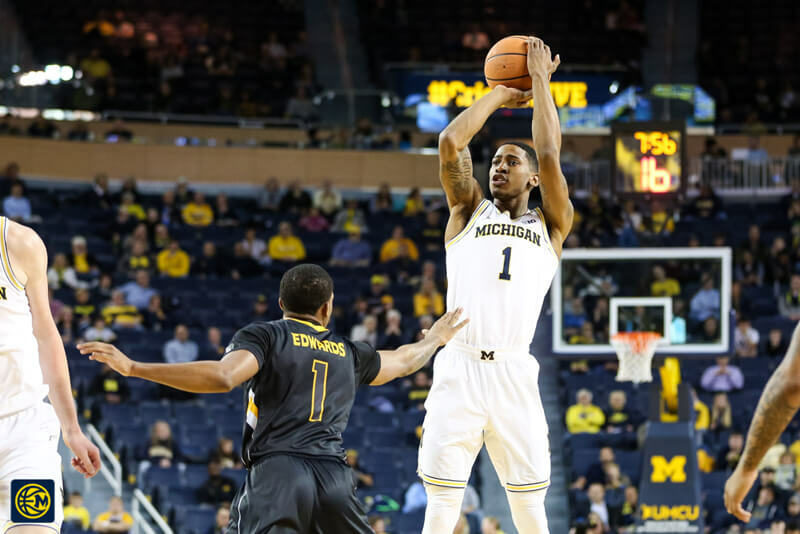 The two names at the top of the Michigan scouting report are Charles Matthews, who sat out last season after transferring from Kentucky, and Moritz Wagner. Matthews is Michigan’s leading scorer at 16.1 points per game and likes to play in the pick-and-roll. After failing to gain much traction as a freshman in Lexington, Matthews is on track to be a breakout star in Ann Arbor. He’s shooting 59 percent on 2s, but has struggled at the free throw line (51.9 percent) and on 3s (31.8 percent). Wagner is one of the most versatile bigs in the country and presents a challenge for Indiana because of his ability to step outside and hit perimeter shots. Wagner is averaging 15.9 points through seven games and is making 67.3 percent of his 2s and 35.7 percent of his 3s. Wagner’s 3-point shooting should be of concern to Indiana as De’Ron Davis may have trouble marking him beyond the 3-point line. Wagner is also an elite rebounder as his defensive rebounding percentage (33.9) currently ranks fourth in the country. Senior Duncan Robinson also starts for Michigan and is an elite shooter who struggles to defend. Robinson is a career 43.3 percent 3-point shooter, but if he isn’t making shots he becomes a liability for the Wolverines. Two frontcourt reserves that Indiana can expect to see are sophomore Jon Teske and freshman Isaiah Livers. Teske is a serviceable center who can protect the rim. Livers is scoring 3.5 points in 10.6 minutes per game off the bench and should be a big part of the program’s future. Michigan’s point guard situation is a revolving door as freshman Eli Brooks, sophomore Zavier Simpson and graduate transfer Jaaron Simmons split the minutes. The preseason prognostications had Simmons as the guy taking over for Walton Jr., but that plan hasn’t materialized. Brooks is the current starter, but he isn’t much of an offensive threat. He’s shooting just 32.1 percent from the field and has a higher turnover percentage than assist rate. Simpson, a former top 100 recruit from Ohio, is averaging the most minutes of the trio, but has a turnover rate (35.5) that Beilein simply won’t tolerate. And Simmons, who arrived as a grad transfer from Ohio, simply appears to be in over his head so far. His turnover percentage is also over 35 and he’s shooting just 23.1 percent from the field. Senior Muhammad-Ali Abdur-Rahkman starts at the off guard and is a better player than he’s shown so far this season. Abdur-Rahkman is a career 34.3 percent 3-point shooter, but is just at 24.2 this season. He’s fourth on the team in scoring at 9.9 points per game. Freshman Jordan Poole is a capable shooter who comes off the bench and should see his role increase as the season moves along. He’s played 23 minutes over Michigan’s last two games. There are only a handful of teams who play a slower pace than Indiana and Michigan is at the top of the list. The Wolverines are averaging just 64 possessions per game and rank 10th nationally in turnover percentage at 14.4. Looking at Michigan’s offensive profile so far, the Wolverines aren’t a team that gets to the line often (24.4 percent free throw rate) nor are they a strong 3-point shooting team (32.6 percent). Michigan also doesn’t emphasize offensive rebounding, a staple of Beilein’s teams. Where Michigan has been solid offensively is finishing 2s (58.4 percent) and much of that is because of Matthews and Wagner, two of the league’s best frontcourt players. Like Indiana, Michigan is getting lit up from behind the 3-point line, but 3-point field goal percentage defense is one of the least reliable stats out there. The KenPom line is Michigan by eight with just a 23 percent chance for Indiana to walk away with a road win. The Sagarin ratings like the Wolverines by 8.5. 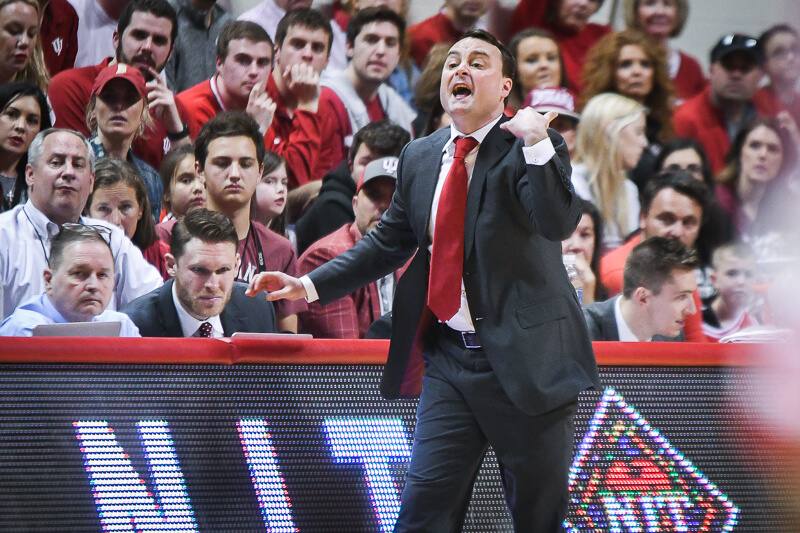 Indiana was good for a half in its first road game before falling apart at Seton Hall. The Hoosiers were terrific against Duke for 35 minutes before fading late. Big Ten road wins are difficult to come by, but Indiana might be catching Michigan at a good time given the early start time and their point guard struggles. Frontcourt play will likely decide this game as Matthews and Wagner have the ability to dominate a game. Indiana will need De’Ron Davis to play more than the 21 minutes he logged against Duke and it will also need Juwan Morgan and Freddie McSwain to hold their own against Matthews. Based on Pomeroy’s win probabilities, Saturday is Indiana’s second best chance for a win in their next four contests. I’d have to have more than one-in-a-row before I’d declare the curse is broken. But we’ll see if somebody has a record night, or something of that nature. Never a bad idea. Underexpect, overexperience… Or something like that. I expect an angry team! I expect them to come out with something to prove. Hard nosed in your face IU basketball. Good Place as any! I predict Indiana to go 13-5 in the Big Ten. I looked at the schedule believe Indiana will be much improved, and capable of winning out the last 6 games. I believe that 2-0 to start B1G play is possible. We are waiting on two players to break through… Justin Smith to develop and increased minutes from Colin Hartman. Hartman looks like he might be on a mission at any second. A few more positive test from playing, and we will have our first captain calling shots from the Wing position. I still think MSU will fall and loose one in SS Assembly Hall. 13-5 in most seasons would win the B1G, however, MSU is on the level of the elite once again. So second place in the first season of Archie ball is predictable. DD could not have been fed more late in the game. Did you see all the free throws? Not the first road game for this group. See Seton Hall. Yep. I see crazy energy in the first, maybe even a lead. But a let down in the second half similar to Seton Hall. Hope I’m wrong though. I won’t pretend to have a good feel for this team. I did think that they would give duke a bit of a fight. I tend to think that going on the road after that loss could be a bit of a letdown for them emotionally. Schematically a John Belein coached team is tougher to prepare for. Hopefully they can come out strong and take care of the ball. Turnovers and three point percentage should be key. Go IU, Let’s get this big ten season started off strong. Agree. However the most important point is a simple one. Every game we are getting better. We bettered the best Acc team for 37 minutes. I anticipate the progress will continue. Not sure that’s enough to get us a win. But the odds are better than 1:5. Not if they don’t call fouls when McRiberts gets pulled down by the shoulders and no call. I forgot how outrageous the officiating is on the road in the Big10. Keeping hope but this is tough to watch so far.